The ultimate fall dessert! 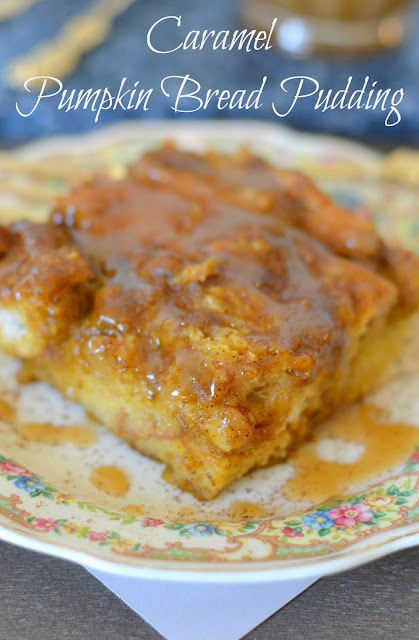 This bread pudding is great for Thanksgiving, game day celebrations or any fall or holiday party! We also love it for breakfast or brunch! What's better than a delicious, warm pumpkin dessert on a cold November day? 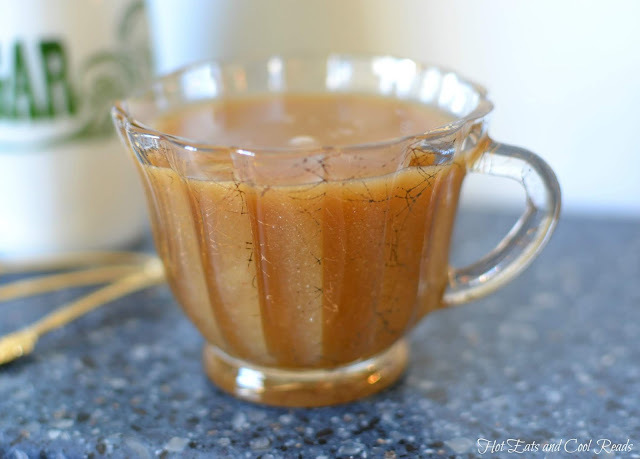 Not much, once you taste this amazing recipe I'm sharing today! Y'all know I'm not much of a baker or dessert maker. Most of the recipes you see here are savory, dinner type of recipes. 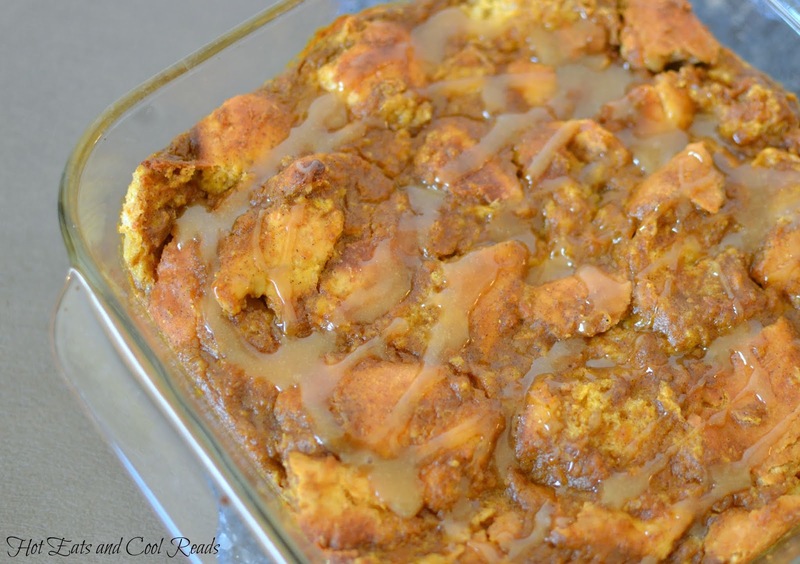 But then, there are desserts like this Caramel Pumpkin Bread Pudding. It was just SO good I had to share it! Not kidding, I managed to eat a good portion of the pan myself. I then decided it was a very good idea to bring the rest to work with me the next day, so I didn't eat the rest of the pan. A few of my co-workers taste tested the rest and they all loved it as much as I did! 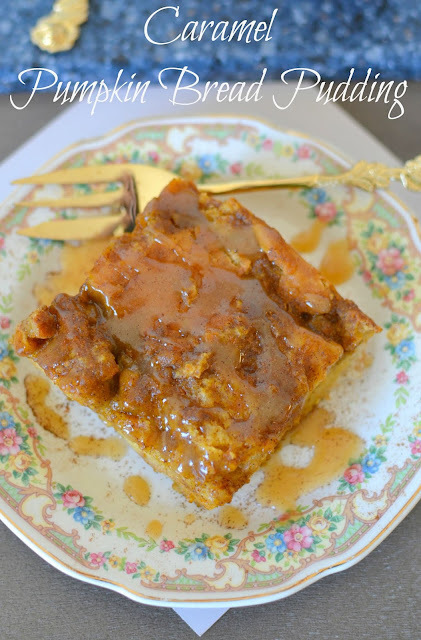 This dessert is packed with pumpkin flavor, and with the caramel sauce drizzled on top, it's pretty much to die for! I mean, just check out that sauce. Cream, brown sugar and butter goodness. How could it not be one of the most amazing things ever? I could eat it by the spoonful, drizzled on this bread pudding, over ice cream, oatmeal and SO much more! It really makes the bread pudding unique, special and drool worthy! Double the sauce recipe and save the rest for another day. The photos for this recipe are very special to me. The gold forks featured in the photos were my Grandma's! She gifted them to me before she passed, and who would've thought, I'd become a food blogger, and use them in my photos 💜She must've known something I didn't at the time, when I was younger. In a large bowl, break apart rolls into larger bite sized pieces. Set aside. In a medium bowl, whisk together the half and half, pumpkin, eggs and vanilla. Add in granulated sugar and 1/2 cup brown sugar, cinnamon and pumpkin pie spice and whisk until combined. Pour pumpkin mixture over bread pieces and fold until bread is evenly coated. Refrigerate for one hour. Grease an 8x8 inch square baking dish and pour bread mixture into pan. Bake uncovered for 35 minutes or until set. In a small saucepan, melt the brown sugar and butter over medium heat. Once the butter is melted and sugar is dissolved, stir in the cream. Cook for about 3 minutes, or until smooth. Remove from heat and cool for 5 minutes. 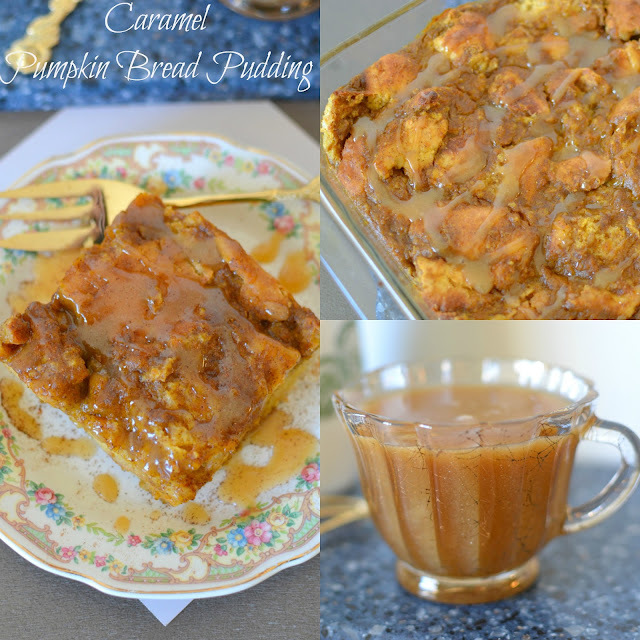 Drizzle the caramel sauce over the warm bread pudding. Serve immediately.